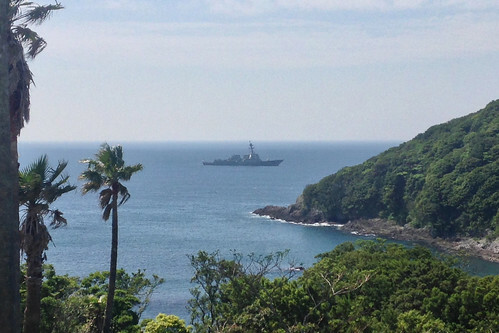 SHIMODA, Japan – The guided-missile destroyers USS John S. McCain (DDG 56) and USS Mustin (DDG 89) anchored at Shimoda May 15 to join in the city's 75th annual Black Ship Festival. As the U.S. Navy representatives to the Black Ship Festival, John S. McCain and Mustin Sailors will participate in goodwill events including visits to six local schools to interact with students and engage in various sports activities. Sailors will also march with local citizens through downtown Shimoda during a parade. The visit allows crew members a chance to learn about Shimoda and experience the local culture. The "Black Ships," or "Kurofune," refers to the Japanese term for foreign ships, which were mostly excluded from Japan for two hundred years until 1854. Commodore Mathew C. Perry negotiated the Treaty of Kanagawa in 1854, the first treaty between the United States and Japan, thus ending two centuries of Japanese isolationism. The Black Ship Festival celebrates the signing of the treaty, which brought the two countries together as trading partners. The Black Ship festivals in Newport, R.I. and in its Japanese sister city, Shimoda, commemorate this historic event with a celebration of friendship. John S. McCain and Mustin are two of seven Arleigh Burke-class guided-missile destroyers assigned to Destroyer Squadron 15, forward deployed to Yokosuka, Japan, supporting security and stability of the Indo-Asia-Pacific.